I haven’t done any soup for ages! I haven’t done a lot of cooking generally speaking full stop actually. Which is a shame as I had that recipe for a while now, and have done it a few times already, and it is the same success every time. I hope you will like it as much as we do at home. 1- Chop the onion, and cook it in a large deep pan with the oil for a few minutes. 2- Cut the leek lengthwise, wash them thoroughly and chop them into 2 to 3 cm chunks. Add them to the onions with salt and pepper, and cook until they become soft, while stirring regularly. 3- Peel and chop the potato and add it to the pan. Melt the chicken broth into 0,6 litre of warm water and add it to the pan. Cover the pan and cook over medium heat while stirring regularly for 25 to 30 minutes. 4- Let it cool down, and mix it in a blender with the milk for 2 to 4 minutes. 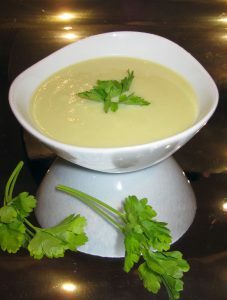 5- You can decorate with a few parsley leaves, before serving the bowls warm. Merci Vevette! 🙂 a toi aussi. Hélas, avec le vrai printemps qui se fait encore attendre, un bon velouté est encore de saison au début de mai.